Now that all the superlatives have subsided and we continue to forge ahead on the Derby trail, it should be noted that because the Fountain of Youth appeared to take very little out of him, he’s going to need a stiff test in the Florida Derby, much like Barbaro, if he’s going to be battle tested enough off only two starts. Of course, he could be another Big Brown and is simply so much better than the rest of them. But this appears to be a much more talented group of 3-year-olds and he probably could use a gut check next time out. But the way he looked in the Fountain of Youth, good luck finding a horse to test him. He now is Pletcher’s top gun, unless Gemologist has something to say about it. His two starts this year and the Remsen last year have built a solid foundation and there’s no pressure on him to run lights out next time. Still can’t find any faults in him – right running style, right pedigree, right temperament, and he won’t back down from a fight. Some question his narrow margin in the Risen Star, but his :23 1/5 and :06 flat final fractions and 5 ½-length gap to third tell you what a big effort this was. Worked 6 furlongs in 1:11 4/5, and as of this writing he is 50-50 for the San Felipe. That race or the Rebel will determine just where he fits and how much progress he’s made. BC Juvenile form has been holding up exceptionally well and a big performance next time will put him right up there at the head of the class. He’s even not ranked this high on the majority of lists, but the feeling here is that it’s mainly because he’s not as flashy as some of the higher regarded horses. But flashy doesn’t win The Kentucky Derby. One thing is for sure if he does stay home, he will either make Out of Bounds and/or Fed Biz look like world beaters or expose their inexperience, because they’re going to have to run their eyeballs out to beat him. The same applies to whoever shows up in the Rebel if that’s where he goes. A little tinkering – removal of blinkers and change of bit – and, voila, you’ve got yourself a Derby horse. Now that he’s shown he can relax and overcome the 12-post and going 6 wide on the first turn, his brilliance and class can take over. You had to love the way he came back to Dominguez after losing so much ground, then settled behind a horse and drew off to a 3-length score under a hand ride. Maker also made other little changes and tweaks and it says a lot about the horse that he responded to all of them. It also shows the importance of having three preps compared to two. He got his bad race out of the way early, which became a learning experience for his connections; got all the experimenting out of the way in race 2, and now just needs to move forward in race 3, likely against better quality horses, without having to risk pulling a Bellamy Road and turn in a freaky performance a race too early. In short, the champ looks to be back and better than ever. Worked sharp 6f in 1:12 3/5. Assistant trainer Scott Blasi says he looks as good physically as he’s ever seen him and his works have been “spot on.” They are considering the Rebel, but are “not expecting his best performance off the bench.” Rebel may be an easier spot than the San Felipe, but a much larger field, so they’ll have to consider all the factors. Wherever he runs, he just needs a good solid performance and to get a lot out of the race in order to set him up for his final prep and more importantly the mile and a quarter of the Derby. He also has to show he’s fast enough to compete with the top guns. Still believe this is very talented horse with a great deal of upside; he just needs to have his two starts go perfectly. Turned in a brilliant work between races, going in :58 1/5 and 1:10 and did it all on his own. But can’t forget the fact that he would be the first horse in 15 years to win the Derby having fewer than 3 races at a mile or longer in his career. And the only horses in memory who have accomplished that – Silver Charm, Sunday Silence, Bold Forbes, and Proud Clarion – all had more than two starts at 3, so he could very well be attempting something that has never been done in modern times. With that said, his Lewis win and most recent work suggest he could be a much better horse than most people think. If you feel he’s taking the right path, he is very intriguing at 22-1 in the Future Wager. Worked 6f in 1:13 2/5. In many ways his next start is the most highly anticipated, because his ceiling is so high. He has shown such flashes of brilliance that a big win in the San Felipe will skyrocket him right up there with Union Rags on everyone’s lists. He is a physical standout and impeccably bred, and the only thing he has to do now is show he can beat top-class horses in stakes competition. 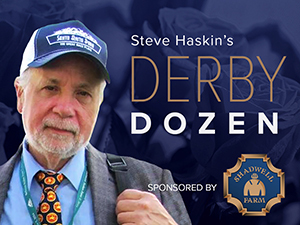 Because he’s never run in a stakes, one can only speculate where he fits among the leading Derby contenders. Even a close second against a horse like Creative Cause or Out of Bounds would be a move in the right direction. If he should win impressively, then his reputation, as his dam indicates, would spinoutacontrol. Worked a half in :49 4/5, as he waits for either the Florida Derby or Wood Memorial. He’s had enough time to adapt to the hot weather in Florida, but a return to the cool weather could be a good tonic for him. If Union Rags looks to be the only major threat in the Florida Derby, he could very well stay there. He would only need to be competitive and finish a good second to set himself up for a big effort on the first Saturday in May. Right now he’s just lurking quietly in the bottom half of the Top 12, waiting for that one opportunity to strike. Remember the one-time band of Bernardinis – Algorithms, Alpha, Consortium, and Casual Trick – high on the Derby Trail? Well, he’s the only one left. Continues to move forward in his training, drilling five furlongs in 1:00 1/5 for his 3-year-old debut. That’s two sharp five-furlong works in a row and he should be ready for a big effort in the Rebel off a 3 ½-month layoff. He is after all undefeated and two-for-two at Churchill Downs, is a grade II winner, has excellent tactical speed, and bred to run all day, so he really doesn’t have much to prove except to show that he’s made progress after spending time at the farm, a tactic WinStar proved successful with Super Saver. He’s been out of sight, out of mind, but could rectify that in a hurry. His placing on here shows just what a deep, talented group of 3-year-olds we have this year. If he only has one more start, which is likely, he’ll fall into the same category as I’ll Have Another. The talent is there, but will he have enough bottom with only two distance races in his career? He does, however, have that important third start this year. Repeating his tail-female family for all those who like the old-time pedigrees from the pillars of the turf. His is the very best of C.V. Whitney. Third dam Silver True won the Spinaway and produced Suburban and Whitney winner Silver Buck, sire of Silver Charm. Fourth dam Silver Fog, by Mahmoud, is the dam of Hall of Famer Silver Spoon, winner of the Santa Anita Derby against the boys and eight other major stakes, and Silver Bright, winner of the Arlington Lassie and dam of State Dinner, winner of the Suburban, Met Mile, and Whitney. Followed up his mile breeze in 1:43 with a six-furlong work in 1:13 4/5, as Baffert continues to teach him to relax early, something he’ll have to do in the San Felipe to show that his dull performance in the Lewis was a fluke. He could also use a clear trip and not get stuck down on the inside again. You don’t want horses backing up into him when the jock is trying to get him to settle. He’s already proven he’s a good horse and a gutsy competitor; he just has to put that last race behind him. Worked five furlongs in 1:01 for the San Felipe, as Harrington said that’s where he’ll definitely run in an effort to collect much-needed graded earnings. Not the easiest spot to accomplish that, but he’s improving quickly. Some believe he’s been closing the gap on stablemate Creative Cause, but he still hasn’t shown the same speed and class, so we’ll see what the next race brings. You certainly can’t get a more illustrious pedigree. Romans managed to pick up another graded stakes placing on dirt with stablemate Finnegan’s Wake in the Gotham, so he obviously is loading up for an assault on Churchill Downs. This colt still intrigues us the most, with his diversity and ability to make a big move at any point in the race. He even is dangerous on the lead. There were so many aspects of his Fountain of Youth that point to him as an up-and-comer to be reckoned with. With a come-from-the-clouds third in the Holy Bull and now a tracking second in the Gotham, he is making great strides with every race. Only Hansen and Algorthims have finished in front of him this year. Like News Pending, he is very adaptable and can be placed anywhere on the track. Breen is looking forward to bringing him back for another crack at Hansen in the Wood Memorial. Worked five furlongs in 1:01 1/5. From a visual standpoint, he was very impressive in the Southwest, despite running a full second slower than Secret Circle, who is simply a faster horse going a mile. But we’re looking at a mile and a quarter, and he should be plenty fast going that far with his pedigree. He’s sort of Baffert’s quiet horse right now, but that could change quickly. With back-to-back five-furlongs works in :59 1/5 and 1:00 3/5 at Gulfstream, he’s more than ready for his long-awaited 3-year-old debut. Unfortunately, it’s going to come on the grass, so we won’t know much more about him than we already know, other than whether he’s maintained his 2-year-old form. He’s going against some tough horses in Exothermic and Howe Great in the Palm Beach, but if he remains on course for the Blue Grass we’re really not going to have a good grasp on what he’s capable of doing in the Derby. His pedigree says dirt will not be an issue and you sure can’t knock the three horses who finished ahead of him in the BC Juvenile. Worked six furlongs in 1:14, then five panels in 1:00 2/5 in company with Secret Circle. He is among three horses Baffert is considering for the San Felipe, but only two will run. Talk about a high ceiling, this colt is capable of anything following his sensational maiden victory, in which he drilled stablemate Stirred Up, who came back to win going two turns on Saturday. But let’s remember, he does have the Apollo curse to overcome, not having raced at 2. What better year to end the curse than on its 120th anniversary. He obviously needs to get two races in him before the Derby, and even then, winning the Derby off four career starts is going to be tough. Only one horse, Big Brown, has done it with four starts or less since Exterminator in 1918, so he does have a lot of history to overcome. Getting real sharp now, drilling a half in :47 3/5 at Palm Meadows. Only two races in Florida are the Tampa Derby and Florida Derby, otherwise he’ll have to ship out of town. Tampa Derby fits his style and ability to make a big early move and try to bust the race wide open. This is another colt with a lot of room for improvement. He has that big move in him, but needs to finish it off. Twice he’s opened clear leads and has gotten caught in the final furlong. But that’s just a matter of timing and maturity more than anything else. With Pletcher’s pair in the Gotham – Dan and Sheila and Raconteur -- not faring very well, it would seem he’s more likely to contest the Wood Memorial over the same track he ran well at in the Remsen. But nothing is definite yet regarding his plans. By the sire of Zenyatta, out of a mare by Barbaro’s sire Dynaformer, he has the Rasmussen Factor (RF), being inbred to Natalma, and also is inbred to Hoist the Flag, giving him three doses of Ribot, and to Hail to Reason through Roberto and Halo. The Illinois Derby is also being considered. Hasn’t worked since his :58 4/5 drill on Feb. 24, so we’ll just wait for him to reappear on the work tab for his final prep for the Palm Beach, where we’ll find out just how good he is after two explosive performances. If this colt handles the dirt in the Derby the way he does the grass, and he should with his breeding, there’s no telling what he’s capable of. He’s demonstrated a European-like turn of foot and just bounds along with big, beautiful strides, which make it appear as if he’s leaping off the ground. Just something about this horse I like. He runs hard all the time, and is always coming at the end, regardless of the distance. He ran into the proverbial buzzsaw in Isn’t He Clever in the Borderland Derby. The winner has shown he loves Sunland Park, and this colt ran a huge race once he leveled off and got into his stride, but couldn’t catch the winner, who came home his last sixteenth in :06 1/5. His broodmare sire, Piccolino, was bred by John Nerud and is by Fappiano, out of stakes-winning Mochila, a half-sister to Cozzene. Pic Me For Fun is inbred to Dr. Fager, so there is a great deal of Nerud’s influence in his pedigree. He would have to jump from a maiden race and get enough graded earnings to make it into the Kentucky Derby, but he’s capable of it in the right spot; perhaps a race like the Illinois Derby. He looked like a classy colt breaking his maiden, rating beautifully right behind the leaders, outrunning the two horses who had him pinned in, and then after easing outside the two leaders accelerated after a late lead change to draw clear. Again, he’s a race behind if he’s trying to make the Derby, so he’ll have to step way up next time. It might be time to start taking this Shadwell colt seriously after he turned in another of his monster moves, beating older horses in an Oaklawn allowance race. Granted, he wasn’t beating much, but there were a few accomplished horses in there and his burst of speed around the turn was pretty devastating. He does it consistently and that makes him dangerous. Whether he can pounce on top-class 3-year-olds the same way is another matter. We’ll just have to wait and find out. Rounding out the Top 40 are Rousing Sermon, who seeks to make amends in the San Felipe; Z Dager, a solid enough third in the Risen Star; Southwest division winner Secret Circle; the first two finishers of the Sam F. Davis, Battle Hardened and Prospective; San Pedro winner Midnight Transfer, who has been working sharply for his stretch-out for the San Felipe; El Camino Real Derby winner Daddy Nose Best; four more Pletcher horses, Discreet Dancer, who is better than he showed in the Fountain of Youth; Ender Knievel, an impressive allowance winner who likely is headed for the Sunland Derby; Spring Hill Farm, who made it two-for-two with a mile allowance score at Gulfstream two weeks ago; and Windsurfer, who ran a super race breaking his maiden after going wide every step of the way; and Howe Great, another talented grass horse who is pointing for the Palm Beach and then Blue Grass. Other names to watch are the Borderland Derby winner Isn’t He Clever; well accomplished maiden Brother Francis, who is back working and heading for a grass maiden race; Scatman, game second to Secret Circle in Southwest division; Street Life, who ran an awesome race at Aqueduct and returns in another allowance test on Wednesday; Stirred up, who won his first two-turn race over the weekend over a really nice horse in Holy Candy; impressive allowance winner Politcallycorrect; Well Armed’s full-brother Arm Force; Gulfstream Derby winner Reveron, Hopeful winner Currency Swap, Battaglia winner State of Play, who likely will run next in the Spiral or return to the grass; and Union Rags’ stablemate Teeth of the Dog.